Well, here I go with another recipe before the year ends. I guess the pre-new year resolution thing is working. This is a very simple and easy to make kabab. Follow the recipe and you should do just fine. Dry grind cinnamon and cardamom together. Powder the pepper corns and nutmeg separately. I prefer to grind these spices separately so that their aroma don't mess with each other. Also so that these spice tastes distinctly in the marinade. Mix all the ingredients (except butter) together in a bowl. With a knife, make one or two very light cuts on the thighs (helps the flavours to penetrate through), prick the chicken thighs with a fork and then nicely massage the marinade on the thighs and into the slits one by one in the bowl. Cover the bowl and leave it in the refrigerator overnight. Cook the chicken in an oven (preheat oven to 200º C) @ 200º C for about 30 mins. Around 4 mins before the cooking ends, brush the chicken with some butter and continue cooking. Serve with onion rings with lightly drizzled lemon juice. Kalmi kabab just melts in your mouth...Enjoy!!! This sounds absolutely delicious! Will surely try it soon. Thanks Simran. Do let me know how it turned out for you. Keep visiting. Wow it sounds Yummmmmyyy... I vl surely try it at hme.. Thanks Maisha. 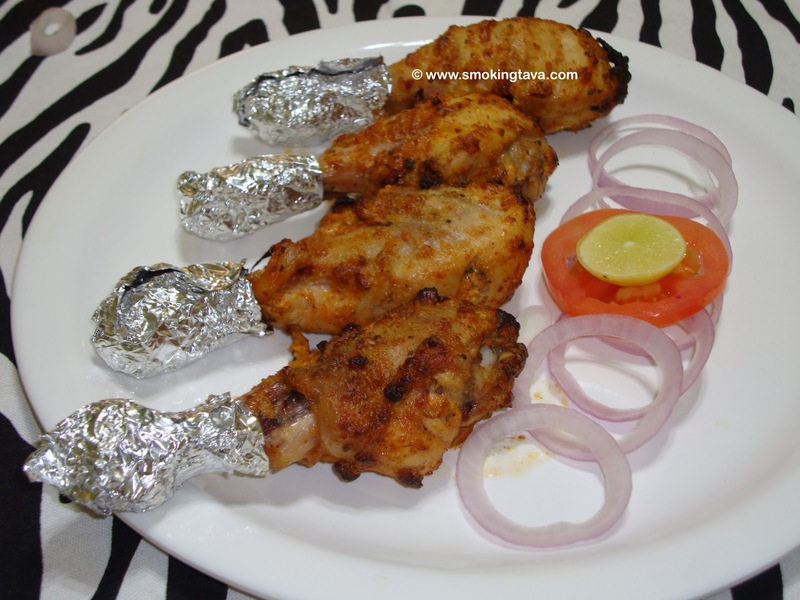 Do share your experience cooking this recipe. Tastes amazing and really simple to prepare. It was the best kalmi I had in years I think. Thanks dude. Btw you ll get lots of accolades easily. Thanks dude. Glad you liked the recipe. Keeping cooking. Recently I tried a kalmi chicken wrap from a food wagon. It was pretty good, so I wanted to see if I could find a similar recipe. Yours came up and I am trying it tonight! Good to hear that. Hope yours came out as good as mine. @Parveenara, you can use a hot griddle on a stovetop to get similar outcome. Happy cooking. Software engineer by profession, Foodie at heart. Copyright © 2009-2012 Anup Raghavan (The Smoking Tava) All Rights Reserved.